« RWR 1.50 is out! RWR version 1.51 is out! See the full change log here. Along the bug fixes, we’ve made some re-balancing by raising the importance of the support player role by adding, besides the already existing repair wrench, a new wrench type into the supply quad resources. Also C4 has been added in the supply quad to further increase the impact of this fun vehicle. Kill combo has gone through another look, too. Recently it was decreased all too much after giving cosmic rewards for big artillery combos, so we came up with a formula to reach a new golden mean. Higher than ever rewards are given for smaller combos, but also big combos still give substantial rewards. This should hopefully make everyone happy and encourage vets once again to use those important strikes in Online Invasion! As by popular request, two new rare weapons have also been added to the already huge collection of over 70 firearms! 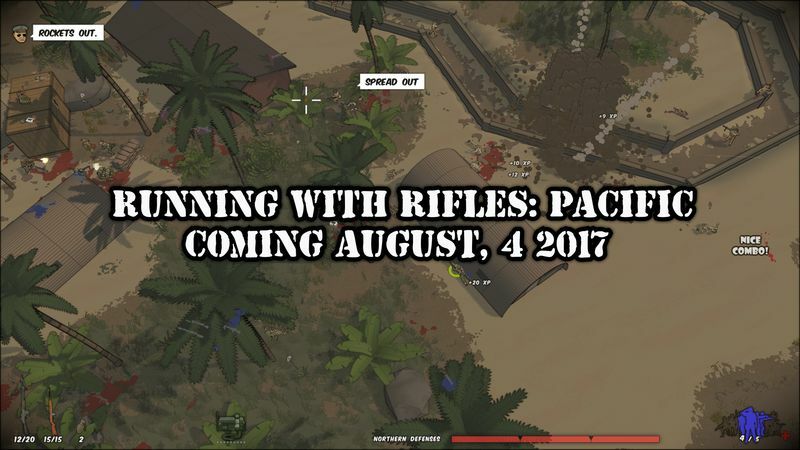 WW2 Pacific war themed “RUNNING WITH RIFLES: PACIFIC” DLC will be available on AUGUST, 4 2017. I have 2 questions about the Pacific DLC. 1.Will it be on Mac too? 2.Will there be any sort of discount for those of us like myself who own RWR? 2. There will be a launch discount as usual. RWR is required to play the DLC, so makes sense the price is same for everyone.